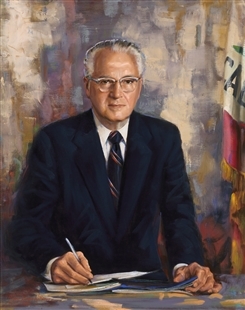 California’s state flag is visible at the edge of the portrait of Public Works and Transportation Committee Chairman Harold Johnson. 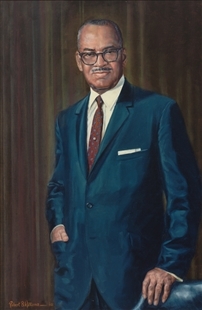 This work was one of five portraits Robert Bruce Williams painted for the House, most with a similarly colorful abstract background that picks up hues elsewhere in the painting. Williams was a Washington-based artist who solicited commissions nationally through advertising in art magazines.